People want to feel a sense of pride when they walk up to their front doors. Residents expect their property managers to provide the high-level outdoor accommodations that are promised with their rent. That includes a neatly mowed property and lush recreational areas. It also means parking lots and driveways that are free of snow and ice in winter. Residents want beds that bloom with color in spring and summer, and pathways that are clear of leaves in fall. 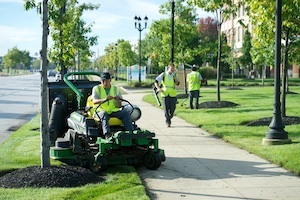 And safety’s a factor during all seasons: Quality landscape maintenance will reduce liability. There’s much to do on Northeast Ohio’s multi-family properties to keep values up, residents satisfied, leases renewed and to mitigate costly expenses that occur when regular landscape maintenance and snow/ice removal are not in place. 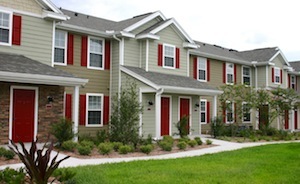 By balancing appearance and safety — practicality and sustainability — Schill Grounds Management creates customized multi-family property maintenance plans for its clients so maintenance expectations meet the demands of property managers and their residents. That’s no easy task. But we’ve got a few decades of experience managing multi-family properties in Northeast Ohio. Here’s what we learned are the top maintenance tasks to include in your annual maintenance program. Residents in your homeowners’ association want to know that the grounds are green, and we’re not talking just about the vibrant color of the lawn. Sustainability is an important factor for consumers today, and that includes those who rent apartment and own condominiums in Northeast Ohio. Many want to know the property where they live is being cared for in a mindful way—that its maintenance involves using minimal chemicals and that the property’s lawn care’s footprint on the environment is light. 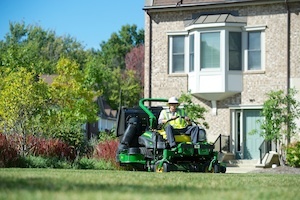 Schill promises that with our hybrid lawn care program, which is 90 percent organic, and our fleets of propane-powered mowers. 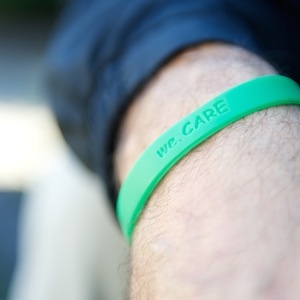 We’re committed to sustainability, and we partner with our multi-family property clients to help them achieve their goals to be healthier environments for those who live and play there. Many property owners overlook the details. What’s a top resident gripe? Poor grounds and common area upkeep ranks No. 2, according to a 2013 study by J Turner Research, a marketing research firm serving the multi-family industry. And, of course, the appearance of the property will attract more residents and boost values. 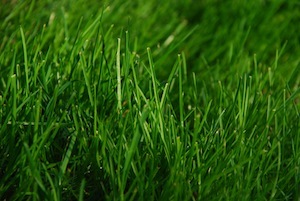 Are there grass clippings on the walkways or driveways? Is snow piled up in front of parking spots or blocking front doors? Are walking spaces completely covered by leaves? Clear the way! Show residents that safety is important by keeping walkways and driveways free of snow, ice, leaves and debris that spoil their appearance and block access to entryways and garages. Make it easy for people to drive into the parking lot, walk to their front doors and enter their homes. This is expected. The commercial maintenance firm you hire to perform snow/ice management, landscaping and fall/spring cleanup should value these multi-family property musts: accessibility, safety and appearance. We appreciate knowing the names of the people who help maintain our properties, and that includes the professionals who care for the landscape, clear the snow on the coldest winter days, and make sure that the grounds are clean and attractive. Don’t you like knowing who delivers your mail by name? Doesn’t it feel great when the maintenance personnel greet you and ask what they can do to help? Landscape maintenance is no different. At Schill, we believe that the professionals who care for your grounds should become part of the landscape. That’s why we make weekly C.A.R.E. visits to maintain the integrity and beauty of the landscape. We grow relationships with the people who live on your property, and those who manage it. We attend homeowners’ association meetings and educate residents about how our services increase the value of the property and create healthy communities. We’re there to answer questions and share the enjoyment of the beautiful landscape. We love what we do, and we bring that passion to the people who live in the communities we service. Multi-family communities in Northeast Ohio trust Schill Grounds Management to create a great outdoors for their residents. Our comprehensive landscaping and grounds management approach covers all the bases, from mowing, bed care, weed control, landscape design and installation, spring and fall cleanup, irrigation maintenance and safety inspections. Plus, we’re with you through the tough winter to keep your grounds clear and safe. Let’s talk about how you can improve the value of your multi-family property by investing in sustainable, full-service landscape maintenance by Schill. Give us a call any time at (440) 327-3030 — or fill out our simple contact form and we’ll get in touch with you!